One of your most frequently asked questions is, “What’s your roadmap?” We decided to use the halfway point of the year to expand our release notes to include notes on our upcoming features. We’re now displaying Twitter results in the third rail. Searchers like Twitter results because they often contain your latest information. 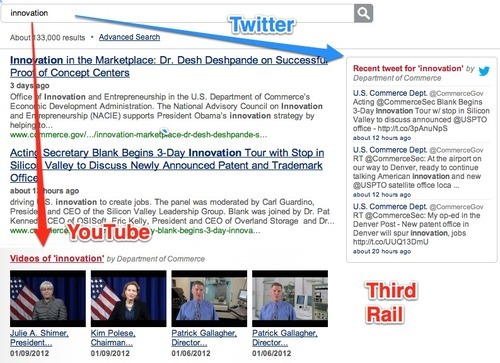 The third rail increases the visibility of your tweets and it allows searchers to see both Twitter and YouTube results above the fold in the browser. See the sample results page below that shows social media results on Commerce.gov for a search on innovation. If you have a Twitter account, tell us the name of your profile and searchers will be able to find relevant, recent tweets when they search on your website. Log in to the Admin Center. Select your site. Click on the Social Media option. Enter the name of your Twitter account and click save. Click on the Results Modules option and opt to show your tweets in a GovBox. Wait until you post your next tweet. Then, go to your website and do a search for a word or phrase in the tweet. You’ll see it as a GovBox intermingled with your web results. Customers with lots of documents will have them indexed more quickly. You may now enter multiple handles if you have more than one social media account for Flickr, Twitter, or YouTube. Mobile searchers can see image results. You may now see whether we’ve indexed your Twitter or Flickr content. We now index Microsoft Office documents (Excel, Word, and PowerPoint). Searchers can no longer see multiple sidebar items selected. Launch jumpstart index for newly added sites with a single site domain. We now label Office documents. We fixed an issue with Flickr indexing. We divide our roadmap into four categories, and we complete one major feature in each category per quarter. Customer Services. We plan to improve and facilitate our signup process. We’re going to automatically populate more content when you add a site so it is easier for you to take advantage of new features. We also plan to create a dashboard to allow you to see what has changed within your search configuration. Content Sources. You’ve requested more control to divide search results into content sources, topics, etc. We plan to offer more flexibility to allow you to divide your content as it makes sense for your searchers. Core Search. One good (or bad) aspect about search is that there is always more work to do in terms of relevancy, speed, scaling, etc. We plan to focus on tuning these aspects, especially for our newer content sources. Search Analytics. We have a growing amount of data, and we want to expose more of it to you. In parallel with providing you just a dashboard in the Admin Center, we plan to proactively notify you of any potential issues. We hope that this glimpse into our recently released features and our short- and long-term roadmap helps you understand what we’re working on and what’s coming down the road.